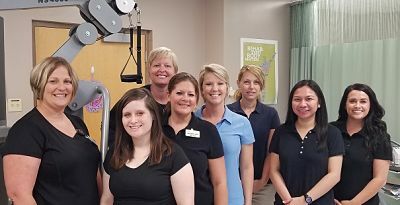 Team members from left, Jennifer Hawkins PTA, Erin Flanigan COTA, Gina Moore PTA, Rachael Janello PTA, Lee Franklin OT, Melissa Simpson ST, Clarisse Gemeto PT, and Kailey Thompson PTA, provide a variety of services to patients requiring physical and rehabilitation therapy. From the moment you schedule your initial appointment, improving your quality of life is our priority! Our goal is to provide comprehensive therapy services to improve your movement and function, and eliminate pain. We achieve this by employing individualized evidence-based exercise and treatment techniques customized to meet your therapy goals. Plans are developed by well-trained, experienced, licensed and specialty certified physical and occupational therapists. We are committed to providing professional excellence in a fun, casual environment. Our Speech and Language pathologists are specially trained to address various impairments in adults and children. In children, early detection and treatment is vital to learning and communication. We provide comprehensive evaluation including testing, development and implementation of a treatment plan to meet you and your family's needs. Speech and Language Therapy consists of assessment and treatment of any impairment related to speech, swallowing, language, and cognition. Whether the impairment is from trauma or from a disease process, rehabilitation of these impairments is critical to returning back to school or employment, successful swallowing, and independent communication. Most patients come to us with a prescription from physical therapy that was issued by their physician-this prescription is similar in form to what you take to the drugstore for medicine-and includes recommendations for treatment. Please arrive 10-15 minutes early to allow time to complete your patient registration forms. When you arrive at the Hospital, Rehab Receptionist will greet you and review the forms. 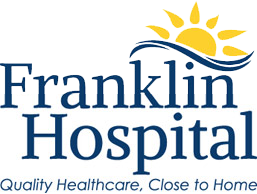 The Receptionist will schedule all of your appointments and collect your co-payment (if applicable) at each visit. You will meet with a physical or occupational therapist, who will evaluate your injury or condition, discuss your goals and specific needs, and develop an individualized treatment plan. The length of your treatment plan and frequency of visits is based on your specific injury/condition, the physician prescription, your insurance plan and the therapist's recommended treatment plan. After each visit, you will work with a member of our clinical team who will instruct and supervise your care. As you reach specific treatment goals, you will progress to new levels, treatments and exercises. In order for our clinical team to get you back to optimal functionality, in a quick and safe manner, you will likely have more than one therapy appointment per week. While this may present a temporary interruption to your schedule, your long-term gains will offset any inconvenience. 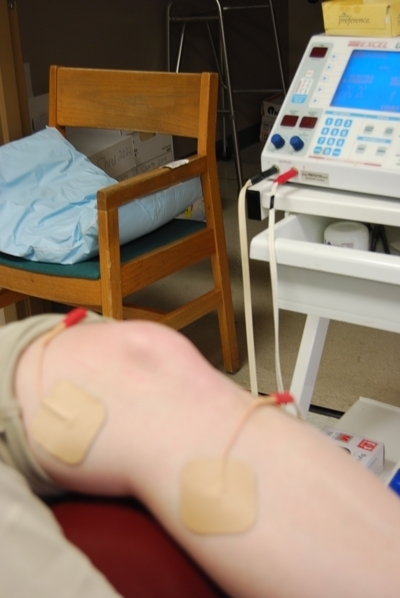 Electrical stimulation (or E stim) is used to increase localized blood flow to a patient’s leg in the Therapy Services department of Franklin Hospital. E stim can improve healing, reduce swelling and stimulate local nerve cells, which can have a pain reducing effect. E stim can also be used for the prevention of disuse muscle atrophy, which can occur, for example, after musculoskeletal injuries, such as damage to bones, joints, muscles, ligaments and tendons. 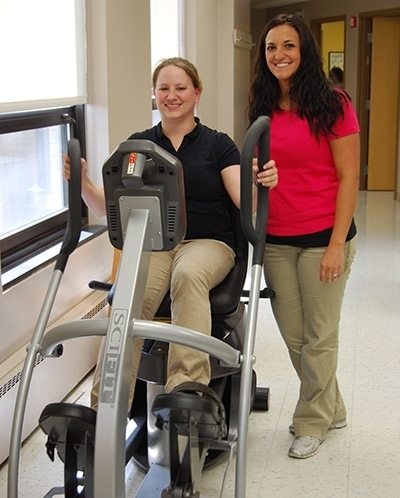 Courtney Lampley uses the Scifit total body elliptical trainer for total body exercise in Franklin Hospital Therapy Services Department while Program Director Leslie Poole observes. Smooth, elliptical movement for efficient total body exercise in both directions, provides knee-to-elbow core exercise. REX’s smooth, natural knee movement replicates climbing stairs to improve functional gait. Courtney Lampley uses the Nautilus leg press in the Therapy Services Department to strengthen four major groups of leg muscles: quadriceps, hamstrings, gluteus maximums, and calves. This therapy is great for patients recovering from hip, knee, or ankle surgery. Courtney Lampley uses the Nautilus shoulder press in the Therapy Services Department of Franklin Hospital to strengthen her deltoids and triceps, along with core muscles while Leslie Poole, Therapy Services Director, observes. This therapy is great for advanced patients recovering from rotator cuff surgery. 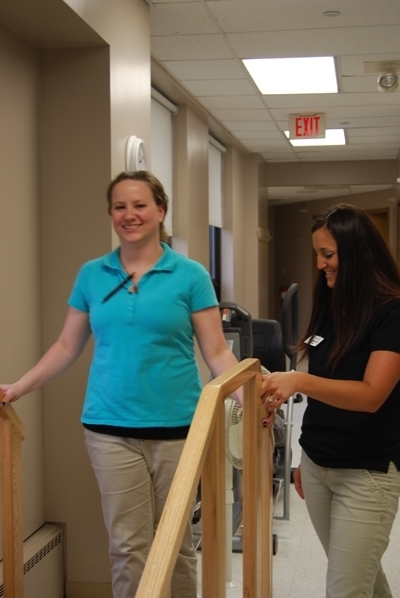 Courtney Lampley uses the stairs to improve her gait as Franklin Hospital Therapy Services Program Director Leslie Poole observes. 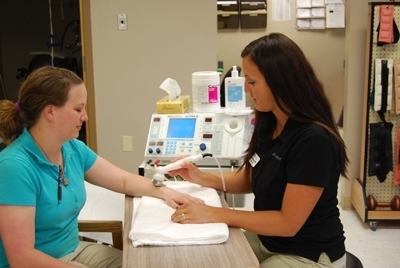 Franklin Hospital Therapy Services Program Director Leslie Poole applies therapeutic ultrasound to Courtney Lampley. Ultrasound is a treatment modality commonly used to provide deep heating to soft tissues in the body. These include muscles, tendons, joints and ligaments.